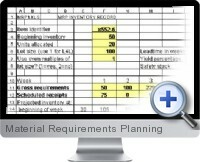 Excel Material Requirements Planning templates include MRP inventory plan and period-order-quantity. These templates help enhance the efficiency of supply chain management and inventory flows. Excel Material Requirements Planning template, MRP inventory plan, computes weekly net requirements for an inventory item for up to 20 weeks in the future. The model then schedules planned order releases and receipts to satisfy those requirements. Lead times can range from 0 to 6 weeks. MRP1 can handle a variety of practical complications in inventory planning, such as units previously allocated to specific future production runs, previously scheduled order receipts, lot sizing, safety stocks, and yields which are less than 100% of production quantities. When the Economic Order Quantity (EOQ) is applied to lumpy demand, lot sizes usually don't cover whole periods of demand. The result is that unnecessary inventory is often carried during the periods following the receipt of a lot. This unnecessary inventory is called 'remnants' because it is left over from previous lots. The period-order-quantity (POQ) model is designed to avoid remnants and give lower costs with lumpy demand.